By Jake Rocheleau in Internet. Updated on May 12, 2018 . There are plenty of cool technologies available to collect and examine data. Both web and desktop applications have provided some really great interfaces to fall in love with data mining, and with the rise in popularity we have noticed an increased number of infographics created over the past few years. Today we’ll be looking into some really cool and popular online resources for data visualization. You can see all kinds of data like human population, world condition and even human emotion presented via the visualization. While some of the visualization might be experimental, all of them have one similarity: they help you understand the data better, and this is exactly what visualization is for. If you’ve designed your own infographic or visualization tool we’d love to check it out. In addition to the examples highlighted please offer your ideas or thoughts in the discussion area below! Now this is one beautiful visualization tool! 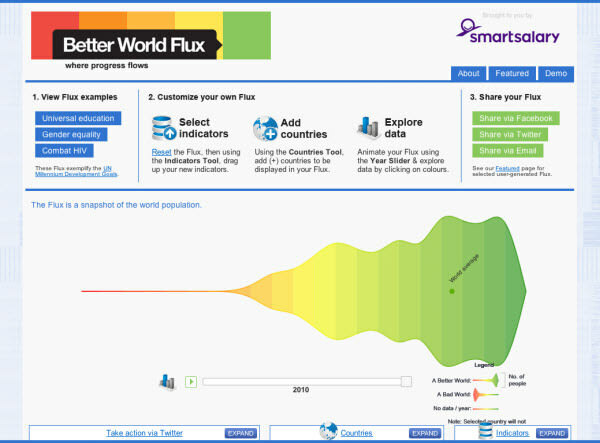 Better World Flux is an interactive information graphic encompassing important ideas around the world. Select a single country or countries of your choosing, followed by indicators such as life expectancy or access to water. They have a small video demo you can watch on YouTube. The refined condition of BWF’s design comes as no surprise. The amount of data available is so pristine, you can easily track the global improvements in society over the past 50 years. Though I will admit the data graph is originally very difficult to understand. Try playing around with just your country to start getting comfortable with the interface. This is perhaps one of my favorite new online tools today. Visual.ly is built with social networking features in mind to connect members all around the world. 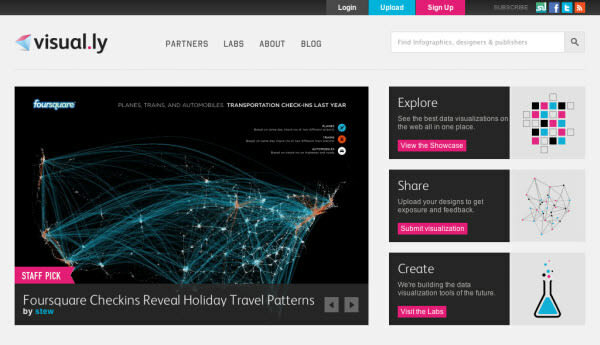 Designers are able to submit their own projects on data visualization and infographics into their site gallery. The showcase can be broken down and sorted into further categories like Food, Environment, Technology, etc. If you check out their labs page it includes some fantastic links about what the team is building. The ideal goal is to offer an interface for creating dynamic infographics directly within your browser. The tool isn’t currently live, although I have heard of some private beta testers. You can sign up with your email address to receive updates and possibly an invite for testing. To add onto their networking features Visual.ly has provided a handful of partner pages. These are similar to a profile page where you can view comments, likes, views, and infographic submissions, but these are targeted towards big-name brands – think National Geographic, eBay, Skype, CNN, etc. As advertised We Feel Fine is an exploration of human emotion. 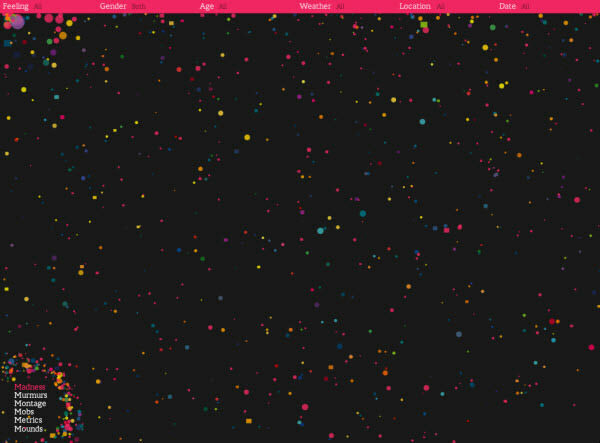 This is one of the most unique visualization engines I’ve ever seen built into a web page. To get started click the large button on their home page. The app will load according to which Operating System you’re running, but thankfully everything appears the same in your browser. Along the top row you’ll find fly-out options to sort the data. Their criteria include age, gender, weather location, and even date. The project offers an extremely detailed analysis of the entire world’s emotions at any given point! It’s truly an astounding experiment for humankind. As you click anywhere in the canvas the flying balls will scatter about. If you mouse over one of them it’ll provide a bit more detail, and clicking will open a whole new bar at the top. Many of the results are pulled from Twitter and actually include photo/video media as well. The number of emotions and feelings are beyond belief. You could easily blow away a few hours playing around in this app. Another personal favorite of mine which really helps to visualize data around the web. If you log into RSS Voyage you are able to import custom RSS feeds into your account for one whole data graph. Alternatively on their homepage you can hit “Start” to go right into the app with default feeds. In this scenario RSS Voyage will pull from a few popular blogs such as The New York Times, Engadget, The Guardian, and others. If you move through the graphic and click on a particular article the view is fixed on screen. This includes the title, a short description, meta data for the publishing date along with the live URL. If at any point you’d like to start creating your own RSS visualizations, all you need to do is create an account! Signup is totally free and you can create your account through the registration form at the bottom of the page. As another bonus feature RSS Voyage allows you to easily set fullscreen mode to browse your RSS feeds in style. The official Revisit project is a way to redefine how we look at Twitter. With this tool you are able to create custom line maps of data connecting tweets related to one or many keywords. You can additionally add a title to your graph and share the link online (even onto Twitter). Clicking on an individual breakaway line off the graphic will display further details. Tweets will often include metadata such as the time posted and important/related keywords. The search criteria are limited to standard Twitter notation which uses a comma separated list of keywords. For the best results keep your queries below 4-5 words since Twitter often has a difficult time matching overly-complicated content. If interested I recommend viewing other projects located on the same website for creative data visualization. 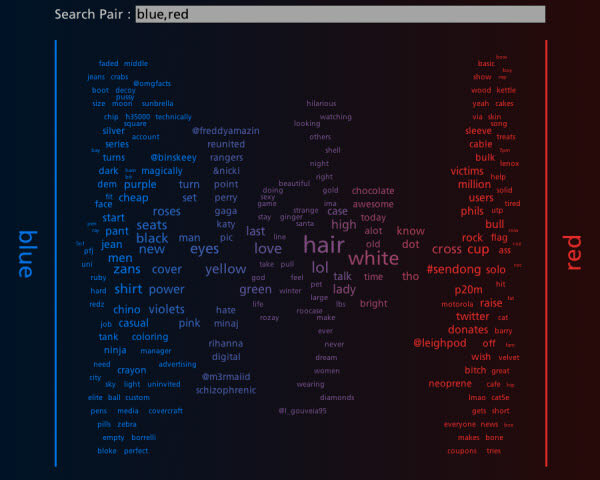 With a fun play on words Tag Galaxy is a really unique visualization tool. Their home page is clean and easy to understand with a single search form for tags on Flickr. In addition the bottom left corner houses some popular suggestions for new users. Simply enter a term and hit Enter as Tag Galaxy queries through Flickr photos. 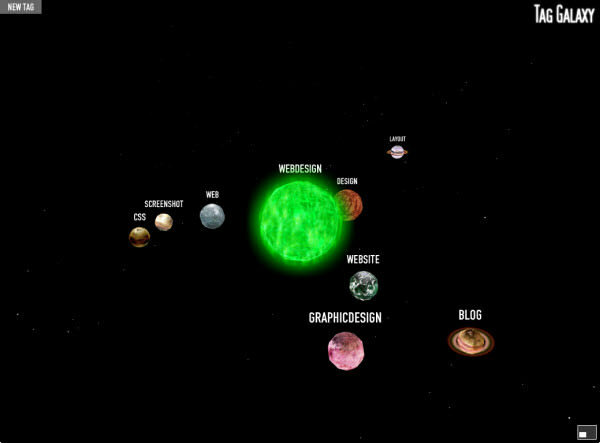 Their rendering engine duplicates the look of our solar system with the central Sun representing the main search term. The orbit of external planets represents similar tags you can look through. 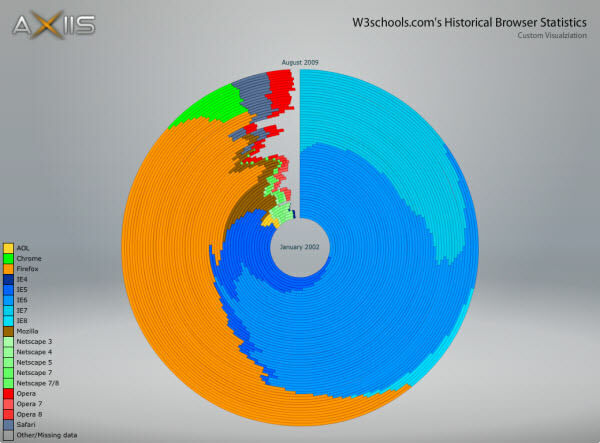 This is one of the coolest visualization demos I’ve ever seen rendered with Flash. Notice that as you hover over each planet it’ll provide you with a small preview number. This is the total number of queried photos found for that tag in Flickr. Clicking on the sun will open a sphere of related photo thumbnails, while rotating planets will add their search terms into the query. Naturally you can find out more about a photo by clicking to bring up full-view. We all know about the powerhouse that is Google. They have been running some really fun experiments in the back of their labs for years, and Google Fusion Tables is one of these. To sign in all you need is a Google Account and some time to play around. This tool lets you share data openly online and build custom visualization graphics. These can be imported from a .csv or Excel spreadsheet. Although not currently supported I would imagine Google will allow the import of Google Docs very soon. After logging in you’ll find a table of public data lists to demo with. These are updated constantly with new user submissions – and I’ve found some real kickers in here before! After opening a document the top toolbar has a Visualization link with additional menus to customize your graphic. The service requires that you sign up for an account before creating timelines. They do offer a free plan with the option to upgrade to premium plan at a later date. 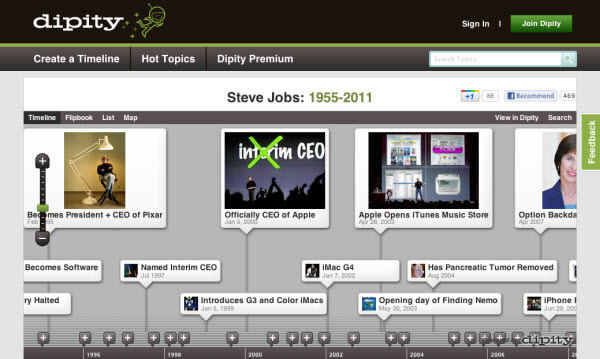 Luckily the most popular member timelines are offered public, so you can easily sort through an exciting laundry list of dynamic timelines. My personal favorite is “Steve Job’s Life and Career” fully formatted with photos even up until 2011. Many Eyes is the unique data visualization tool put out by IBM. They offer a whole slew of categories to explore for customized data topics. Some of the most popular examples are featured on the home page, many of which are user-created. Examples include Number of 3D Films released from 2001-2010, and even a word/tag tree from Obama’s recent Jobs Speech. To create a set you’ll need to first organize your data. This can be practically anything, but should be something relatable and easy to display. If you want to publicly store the visualizations I recommend creating a free account on the service. There are a ton of features available to members plus the added benefit and security of storing personal data sets. If you get lost spend some time browsing the FAQ/Tour page to learn a bit more about the Many Eyes’ interface. Speaking of unique visualizers Wikipedia is also a network you don’t see developers playing with as much. This is surprising, since the main Wiki contains a ridiculously large amount of data! WikiMindMap lets you select a region and enter the URL for a page. If your keyword doesn’t exactly match up with a page ID the app will offer you the closest suggestion. The link generated inside the circle will lead out to the main Wiki page, while the refresh link opens a tree of options. These are all related links pulled off the main wiki page coordinating to your keyword. It’s also really easy to switch onto a new root node by clicking the green refresh icon. 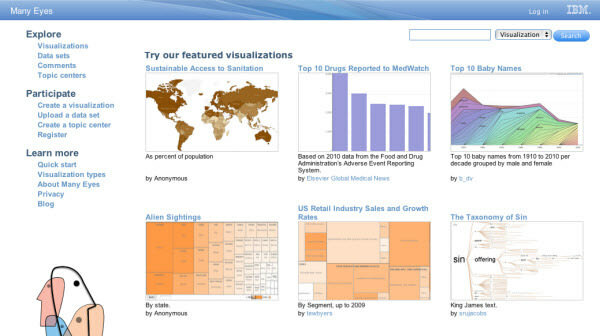 Axiis is notably one of the most popular websites for data visualization software. On their homepage you can find a handful of cool downloads to run on your PC or Mac computer. However along with these resources there are plenty of tools online to fidget around with. Notably one of my favorites is the browser market sharing graphic. W3Schools has been polling users and tracking browser stats for a few years now. Axiis has compiled a beautiful visualization graphic from 2002-2009 relating to the most popular web browsers. Among the many listed include Safari, Opera, Netscape, Internet Explorer, and Google Chrome. The list hasn’t been updated for 2010/2011 but we may see a newer infographic released in the coming months. I’m sure when you think of data visualization Twitter is one of the first networks to pop up. There are billions of tweets flooding the Internet every day, so it comes as no surprise the network is huge. Tweet Spectrum is a custom built web app using Java. Enter two keywords you’d like to compare and the spectrum will fill in surrounding keywords. This is a fantastic way to visualize words related to similar topics. For example you may enter “monkey” and “chimp” to find similar animals and lifestyle habits. It’s difficult to expect any typical results since Twitter is such a robust network, but this is what makes Tweet Spectrum so unique! The app was created by developer Jeff Clark who runs a popular data visualization blog. 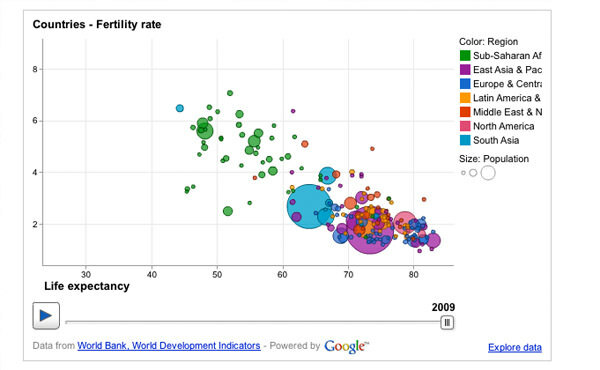 On his site you can find loads of graphics and charts relating to visualizations over the years. He also hosts a slew of similar Twitter apps which you can find throughout his portfolio pages. Another really fun browser app is Wordle. You can play around with graphic visualizations of word clouds from practically any medium. Best of all you don’t even need to sign up for an account to create a mashup. 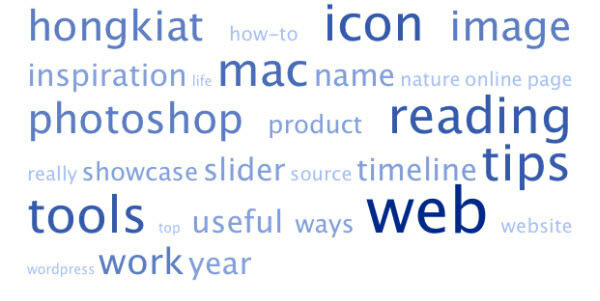 Wordle gives you three options: pasting in custom text, adding the URL to a blog or feed, or using a Del.icio.us account name to display their tags in cloud format. Wordle isn’t all about interactivity. Even just browsing through the site you can find a lot of really neat mashups from previous users. Check out the Wordle Gallery to see what I mean. The system is a bit convoluted to get adjusted with right away. 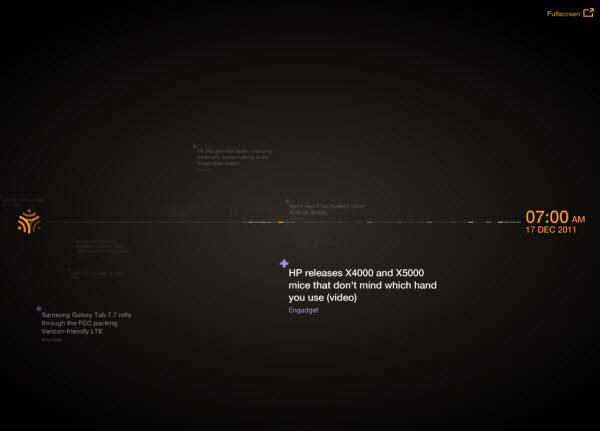 I personally love text and word visualization trees. 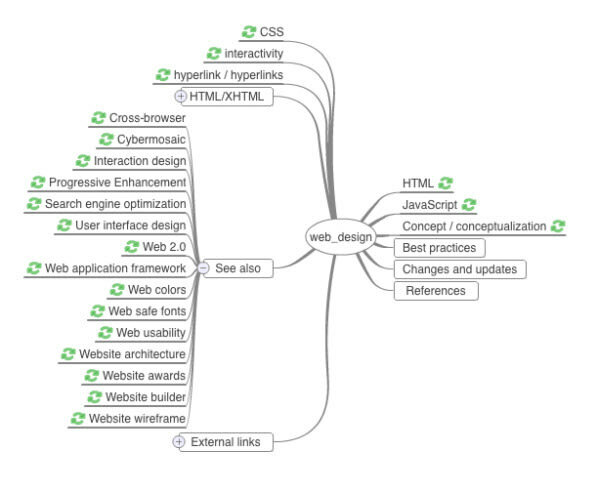 The features Wordle offers are not something you can easily find in any standard web application. I highly recommend toying around with their interface even for just a few minutes – you won’t be disappointed. 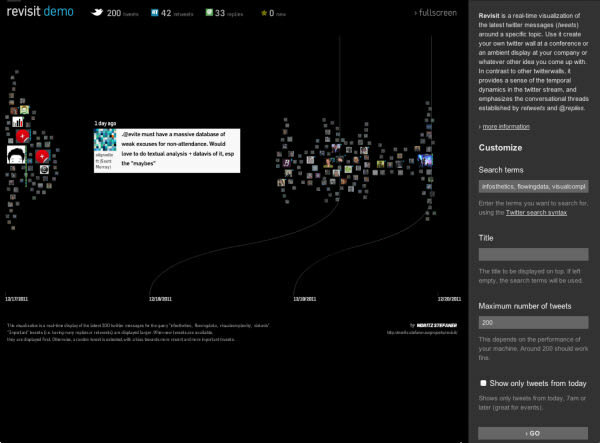 Tag Crowd is an awesome web-based cloud visualization tool. You can paste in your own text or even link to another website online. The application will automatically parse the page for content and rearrange popular keywords by size and density. There have been a few other popular solutions to this, however I feel that Tag Crowd is the most elegant, not to mention it doesn’t require installing any 3rd party software. They additionally offer you 3 choices: uploading a file (such as .doc or .pdf ), linking a web page, or directly pasting your content into a text area. There are also some configuration options including max and min word frequencies. Vuvox is another interactive web app for designers and data lovers. You can share slideshows and photo galleries dynamically on your own website or profile page, but you aren’t limited strictly to photo media – in fact Vuvox allows for music and video uploads as well! Notice this is another service which does require you to sign up for a free account before creating visualizations. This requirement is in place mostly to cut down on server costs from anonymous usage, but after joining you have access to some really fun tools for creating collages and data slideshows. Many users offer their creations publicly to browse through. Vuvox has a featured gallery for exactly these types of presentations. Do you run any websites with visitor tracking data? Chances are you’ve heard of Google Analytics and at least toyed around with the service at some point. Juice Kit runs a fantastic appspot web interface called Analytics Visualization. After connecting into your Google Account the app can pull out data from any of your profiles. This lets you organize and examine number of pageviews, popular page content, and related keywords throughout Analytics. Each of your websites can be configured to display data in a weekly/monthly/yearly cycle. The graphics can be split into a word tree or block area content, respectively. Check out the Juice Analytics official website to learn more about the company and their goals online. Here’s another really fun tool to examine the latest news around the world. Newsmap was built by a Japanese developer to import all the latest articles from Google News. The mosaic displayed in-browser can be customized by region and category. There is additionally some really great search functionality built into the top-right corner. If you notice an interesting news story, hover over the block area to be given a preview image. This often includes some of the article text along with a link to the domain URL and time of publication. Articles with a larger block are generally more popular among Google users. 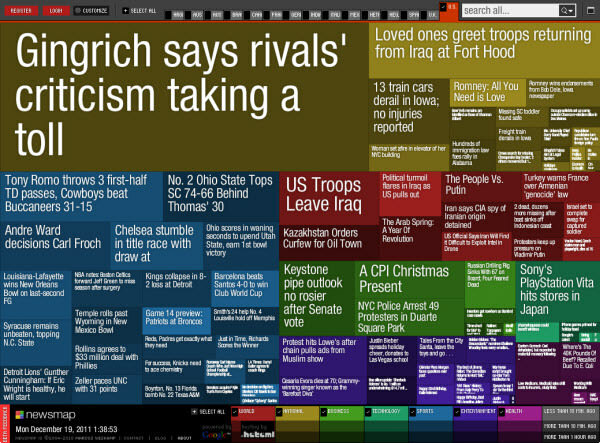 The visualization techniques used are perfect for those looking to check news at a glance among a wide range of topics. If you didn’t notice by now each of the news blocks are color-coded to match a selected category. You can figure out which ones are matched in the key menu at the bottom. Big fans of LinkedIn will really enjoy this app. The developers of LinkedIn have been working on private apps in their Labs area. This is similar to how Google, Digg, and other popular social networks have begun tinkering with new features. 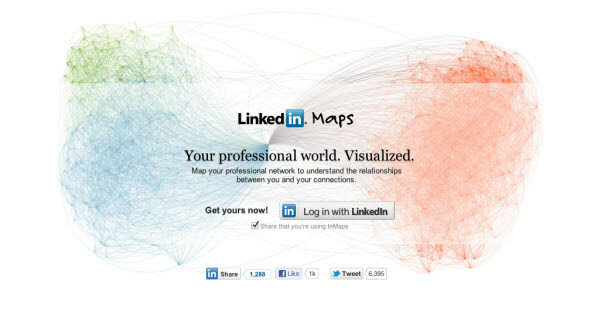 Simply connect into your LinkedIn account and InMaps will do the rest! The visualization is performed in-browser with a complicated web of connections. These stem from your main network node to include your friends and people you may know. In simpler terms you are constructing a map of your professional relationships on LinkedIn. All the maps use a stringy color-coded formatting effect but you can rearrange the look by clicking “Next Map” in the bottom-right corner. 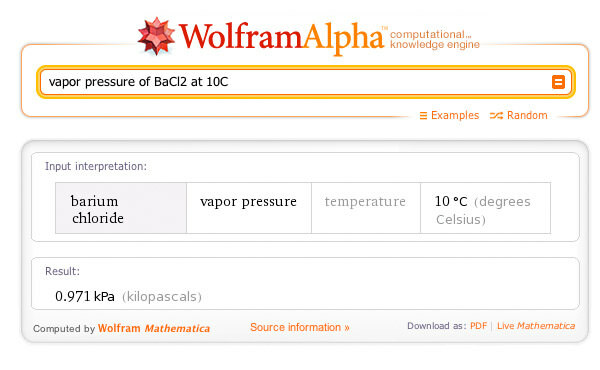 We are all familiar with Wolfram Alpha by now, or at least heard some ideas about the search engine. The goal was to build where Google left off by taking in arguments far more complicated than general searches. These include mathematical graphs, unit conversions, historical events, and scientific formulas. It’s more of a wiki of scientific information combined with a dynamic computer search, and the developers are constantly refining how search keywords are used to display results. For those of you still confused check out their quick site tour to get a better idea. Not everyone will find Wolfram useful but it is a very mathematical tool to have accessible from any browser. Earthquake is a natural phenomenon we have to deal with, but luckily humans have evolved over thousands of years to develop useful technology to aid us in survival. 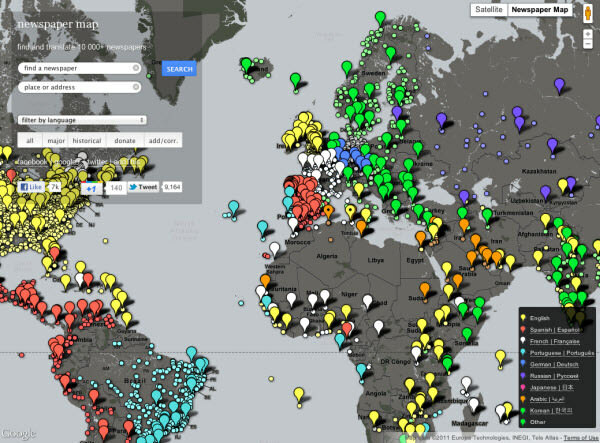 Global Incident Map is a visualization tool that is powered through Google Maps. You can check out fires, AMBER alerts, aviation accidents, and a lot of others. The earthquakes map is updated locally and fresh to the minute. 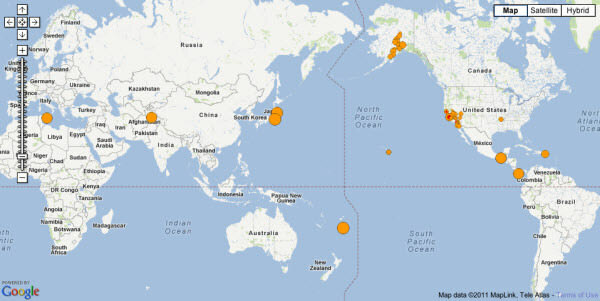 Below the actual map is a table sorted by most recent EQs worldwide. Important data is included such as geo-coordinates around the globe, magnitude, and depth. These days you can never be too careful, and this is one piece of technology I’m happy to have at my fingertips! Here we have another cool Google project that is distinctly different from Fusion Tables. Public Data Explorer is a unique app which lets Google users upload and check out older data sets. This includes practically anything from worldwide fertility rates to US unemployment ratings. You also have Google’s graphic engines at your disposal to mockup the data in any way you choose. Google Maps and charts are some of the most popular choices. Bar graphs, pie charts, and scatter plots elegantly display some of the most complex data right in front of you, and the best part is that Google will host your creations for free under your own account. Just hit the admin area to get started uploading data. You can even open your visuals publicly to be added into the directory of live projects. Some really cool stuff pumping out of Google Labs! This fantastic collection of tools covers some of the greatest apps we have in 2011. Web developers are constantly looking to push the envelope further, so we can surely expect to find even more exciting releases in the coming months. For sure we would love to hear your feedback and ideas on data visualization and infographics around the web.